Dodd Camera will have 16 Factory Reps on site to answer your questions. Dodd is also offering 30 Minute Tech Sessions with the industry’s best teachers at no charge and no reservations required. 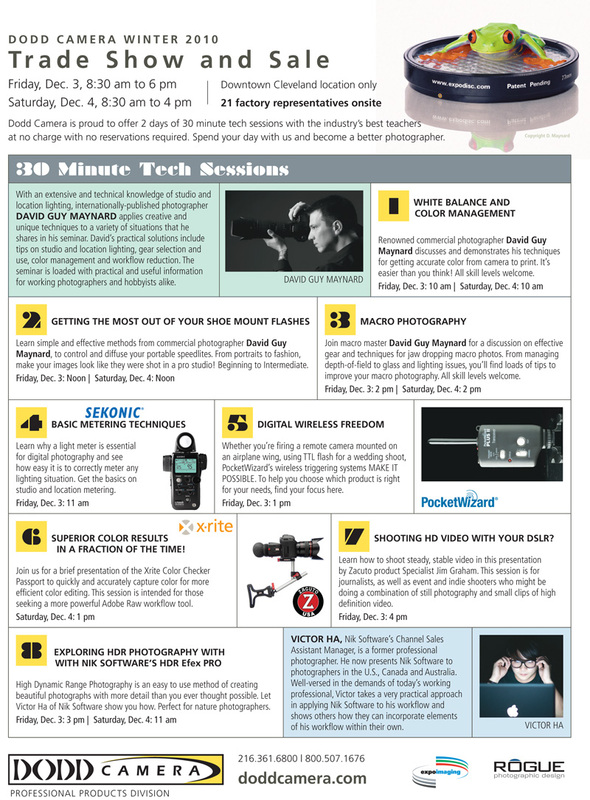 KEH has also been invited to the Dodd Camera Winter 2010 Trade Show and Sale. KEH is ready to buy your equipment during this exciting two day Trade Show and Sale. At the next NOCA ONE INDUSTRY Forum peer into the future when a panel of industry leaders representing a broad swatch of Northeast Ohio marketing communicators expound on their expert insights as to what 2011 may bring. Will business be up or down? Hiring or firing? What will the industry look like in 2011? Join us Wednesday, December1, 2010 in The Plain Dealer Community Room – 1801 Superior Avenue. Montrie Rucker Adams, President/Chief Visibility Officer, Visibility Marketing. Continental breakfast will be served at 7:30 a.m. with the program starting at 8:00 a.m. Admission is $20. Seating is limited. Click here for reservations, or call 216.999.4028.